Dylan kept silent for weeks after he was announced as the Nobel literature laureate, and snubbed a ceremony in December to receive the prize. STOCKHOLM: Music icon Bob Dylan will finally receive his Nobel Literature Prize this weekend at a meeting with the Swedish Academy in Stockholm, it announced Wednesday. But no media will be allowed to cover the meeting, and the famously-reclusive Dylan will only give a lecture required of him in a taped version at a later date. "The good news is that the Swedish Academy and Bob Dylan have decided to meet this weekend," Sara Danius, permanent secretary of the Academy, wrote in a blog post. She added: "The setting will be small and intimate, and no media will be present; only Bob Dylan and members of the Academy will attend, all according to Dylan's wishes." Dylan is set to perform concerts on Saturday and Sunday in Stockholm, the first stop on his European tour. Danius didn't specify if the meeting would be held before or after the concerts. But Dylan, the first songwriter to win the prestigious prize, will not hold the traditional Nobel lecture during the meeting, she said. 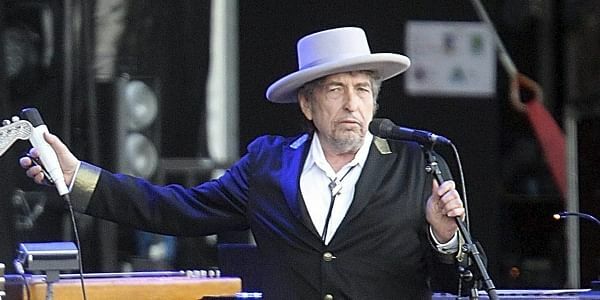 Because the lecture is the only requirement to receive the eight million kronor (839,000 euros, $870,000) that comes with the prize, Dylan will not be handed the money during his Stockholm visit, even though he will collect the Nobel diploma and medal. The lecture can take nearly any form, including a short speech, a performance, a video broadcast or even a song, but must be held within six months of December 10, the date of the Nobel prize ceremony and the anniversary of the death of its founder Alfred Nobel. "The Academy has reason to believe that a taped version will be sent at a later point," Danius said, without specifying an exact date. Previous Nobel literature laureates have presented taped lectures, including the Canadian writer Alice Munro in 2013. Dylan, the songwriter of "Blowin' In The wind", "Knockin' On Heaven's Door" and "Hurricane", has until June 10 to send his lecture. When Dylan was asked in October why he did not respond to the Academy's calls, he told the Daily Telegraph: "Well, I'm right here." The rock enigma later snubbed the Nobel ceremony in December because of "pre-existing commitments" which he never explained. But he sent a thank-you speech that was read aloud during the ceremony in Stockholm. Maria Schottenius, a literary critic and columnist at Swedish daily Dagens Nyheter, said she believes Dylan does care about the Nobel. But she said the glitziness of the ceremony, attended by Swedish royal family and politicians, was bothersome for the media-shy and anti-establishment rock star. "(A) prize from the king's hand, tailcoat, the world's finest party with a long lavish televised dinner... not his cup of tea," she told AFP. In a humble speech read in December, Dylan apologised for not being able to attend the ceremony and expressed surprise over being chosen as a laureate in the league of authors like Ernest Hemingway and Albert Camus. "Not once have I ever had the time to ask myself, 'Are my songs literature?'" his speech read. "If someone had ever told me that I had the slightest chance of winning the Nobel Prize, I would have to think that I'd have about the same odds as standing on the moon," it added. Several other literature prize winners have skipped the Nobel ceremony in the past for various reasons. Doris Lessing (2007) did not attend because of her advanced age, Harold Pinter (2005) because he was hospitalised and Elfriede Jelinek (2004) due to her social phobia. Each of these winners performed their lectures that were either delivered to Stockholm or read aloud abroad.